Thanks so much for hopping along with us today! If you have arrived here from Denise's blog then you are on the right track. 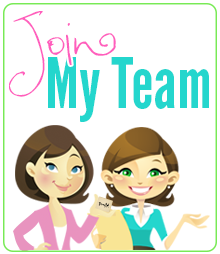 If you would like to start from the beginning then head on over to Joy's blog. 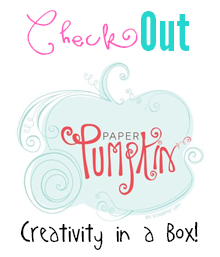 I am super excited to share with all of you my project for Joy's Thank you Gift Blog Hop! Isn't it fabulous to to be surrounded by so many talented ladies? 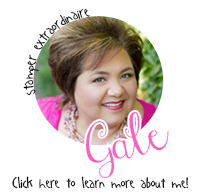 I am truly inspired and I just love the blog hops!!! I am giving away a set of Heidi Swapp Alphabet Stamps! 2. Leave me a comment. I will choose the winner via random.org tomorrow and announce the winner on Tuesday! Below is a list of all the blogs in the hop. 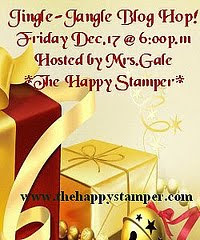 Thank you for visiting with The Happy Stamper and make sure you hop on over to Janis, she is the next blog in the hop! Super cute idea Gale! I have never seen snowman soup before! I may just have to make some! What a cute idea Gale. I was gonna follow but when i tried it said i was already a follower. I tend to forget who i have followed and not. So i put your blinkie on my blog. Thanks for sharing this. I've never seen this before either. Love, love, love the tip about the handle and I do have that punch. I'm fairly new to blogs and YouTube but that was one punch I picked up along with another but I can't remember now what that is for some other project I made. I've seen many versions of snowman soup, but I love how you added the handle to make it look like a cup - great idea - thank you so much for sharing that will us. This is a great idea! I love that the card looks like a little mug! I just LOVE that snowman, how cute is he!? TFS! I'm a new follower. Thank you so much for a chance to win! Happy Holidays!! Such a cute project! Thanks for sharing! Gale these are SO CUTE! I love how yo did the mug! TFS! I just LOVE this!! I wish they still had this stamp set! I don't have any snowmen as cute as this one! Thanks for sharing! super creative and just the right touch to say "thanks". This is sooo cute, could you post the little poem you used, thanks for this wonderful idea! Such a cute way to give a little warmth. Thanks for sharing - I became a follower today! What a sweet idea. I love the way you created a mug. So cute and clever. Thanks for sharing this great idea Gale! I can't wait to make Snowman Soup for my students! Super cute idea! TFS. I'm already a follower. Love your Snowman Soap. Your video was fun to watch! Love this gift idea! Too bad they retired the snowman stamp. TFS. I just love your blog and videos. You make me smile :) This project is just adorable!! I love the clever handle you made on the card! I've been a follower for some time! Gale I just love it. Thanks so much for sharing. The tutorial was great. So cute Gale. I've never heard of snowman soup before. I gave you an award this morning too. Check it out at http://stefenithegreat.blogspot.com/2010/12/blogger-award.html Thanks for all your great videos, I really enjoy them. This is sooooo cute, love the snowman! Luv the Vid! Thanks for sharing! I'm your newest follower! That is super cute. I've never seen snowman soup before. That would be a great little gift for coworkers! Very cute!! I am already a follower. Love your blog. Gale I so need that punch now!! How easy was that to make this mug?! And its so stinkin cute!! LOL.. How adorable! No, I have never seen "Snowman Soup" too cute!! Cute, cute and cute, thanks for share. What a cute idea & I love the snowman stamp! Wonderful gift. Thank You for being in the hop and for chances to win great gifts. I don't think I've seen such cute snowmen. Thanks so much for sharing. Thanks for playing, this blog hop is great! i have never heard of snowman soup. where have i been! thanks for sharing! I love it!!! Such a cute idea...love snowman soup!! Thanks for the inspiration and your wonderful creativity. Adorable. I love that little mug. The first time I saw snowman soup was at my church dinner. So cute. Too cute! I am a follower and subscriber. This is adorable. Such a cute idea. Thanks for sharing. I am a follower. Cute packaging for snowman soup. Follower. Very Very Cute.... great gift idea thank you for sharing. This is just so cute! I like how you just tore around where you had stamped, it gives a nice effect with the inking! That is so stinkin' cute! Using that punch to make the handle that created your mug was GENIUS! I was watching and thinking, "I have that punch, I wonder what she's going to do with it?" Then I thought it was so AWESOME that you used it to make a mug handle I turned my laptop to my husband just to show him. :) He was equally impressed. I think your project is so cute! Thank you so much for being part of my Thank You gifts blog hop! What a great idea! I had never seen this before! I am a new follower and look forward to seeing other great ideas! Great idea! Love the snowman. Just became a follower. Super cute Gale. Great video. So cute. Thanks for the video. I love the twist you did with it. Great gift idea and video. Thanks for sharing! I love how you put this together!!! So so cute!!! Great idea. What an adorable thank you gift! I love it!! The little sentiment just makes it! Great idea Gale! I'll have to add that to my list of gifts to make! Having a newborn at this time of the year has had me focus on family more and less on crafts, but blogs like yours are such an inspiration to me! Love your idea. Thanks for sharing this project with us. I've never heard of this before. That is so cute!! I might have to give this a go! TFS! And I just started following! So cute thasnk for the tutorial. I am now a follower. what a wonderful idea. thanks for sharing. Super Cute! Love the cup! This is so cute I love the name of it! I may repicate it using the peachy keen gingerbread stamp set and so gingerr bread ingrediants! Thank you for sharing! Such inspiration! Darling drink mix idea, thank you so much for sharing. I am a new follower. Looking forward to seeing more of you ideas. love the handle idea!!! I do the snowman soup too! I love, love, love your little mug of snowman soup!!! 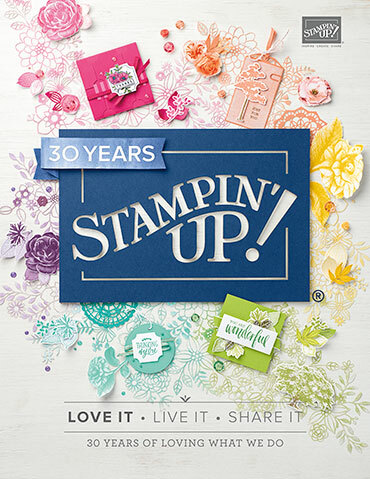 :) And I am so excited, because I have that cute Stampin' Up! Frosty Stamp Set! I'm a little behind this year, but I definitely hope to make a few of those! Thanks to your detailed video, I just might be able to scrap lift them. Thanks for the chance to win! Love your snowman soup..sounds good right about now..brrr...it's cold.